Hello Friends! It's been a super busy day, but I managed to color up a little something. I recently received some new goodies and I was eager to play. When I began this 30 Day challenge, I told myself that I would try to color SOMETHING every day, even if it was leaf, a feather, a flower or a ladybug...just something to practice my coloring. I've had my eye on the Simon Says Stamp Stitched dies for some time. I finally bought the bundle, where you get all three sets; rectangles, squares, and circles. I'm so happy with them and I decided to use them on my project today. I started out by die cutting a rectangle out of white card stock. 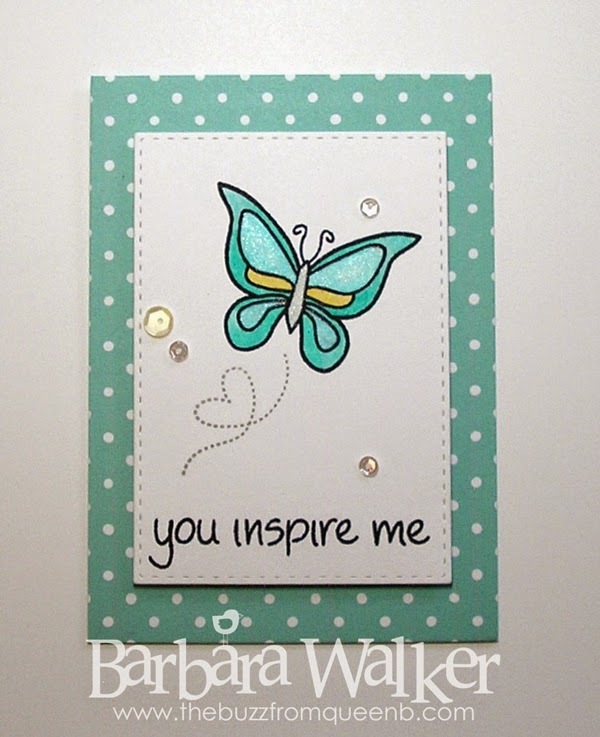 Then, I stamped the butterfly image and the sentiment using that delicious Black Licorice ink from Lawn Fawn. Next, I colored the image with Prismacolor colored pencils and blended it with Gamesol and a blending stump. 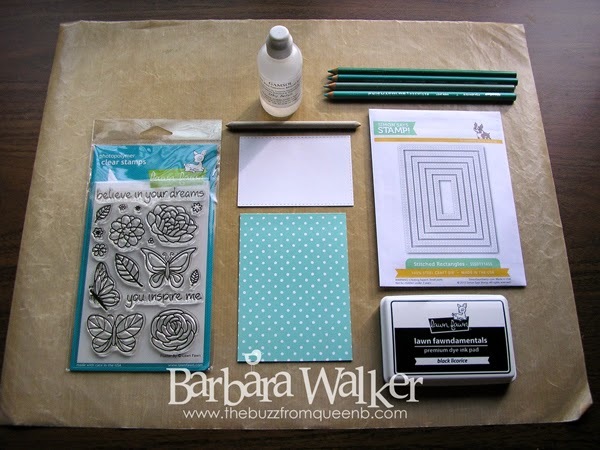 I bought the Flutterby stamp set just for this challenge because there are so many images that lend themselves to really fun techniques. Since the coloring was so easy, I decided to make a CAS card. After I colored the image, I added a little shimmer with a clear Wink of Stella brush marker. Then mounted the focal panel with dimensional adhesive and added a few Pretty Pink Posh sequins to finish it off. You can see the shimmer a little better here. 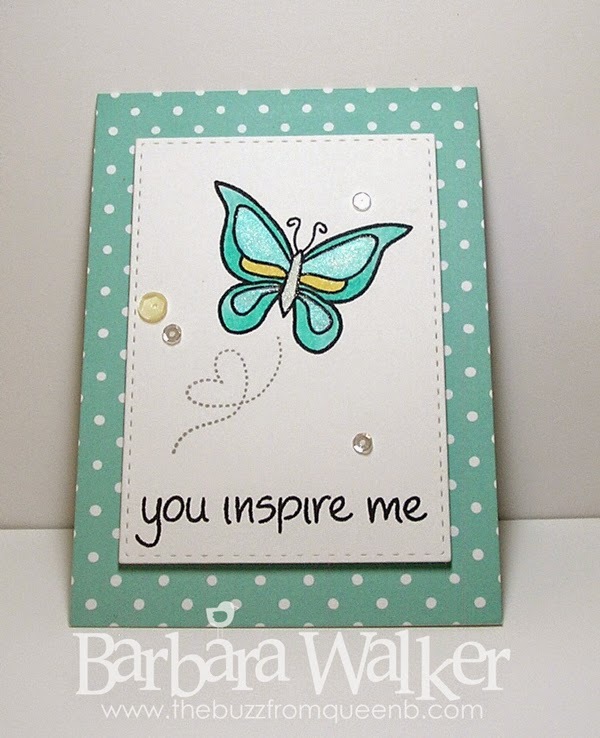 This is a 4bar note card from Lawn Fawn, the color is Mermaid. I think I really like this smaller size for quick, clean and simple cards. The note cards come in a rainbow of colors and I think it would be nice to make a set of all occasion cards to give as a gift. Lawn Fawn makes envelopes for them, too. Hmmm...something to think about. And that is all I have to share today. Thank you so much for visiting! Precious! Congratulations on your Stitched Die haul!! 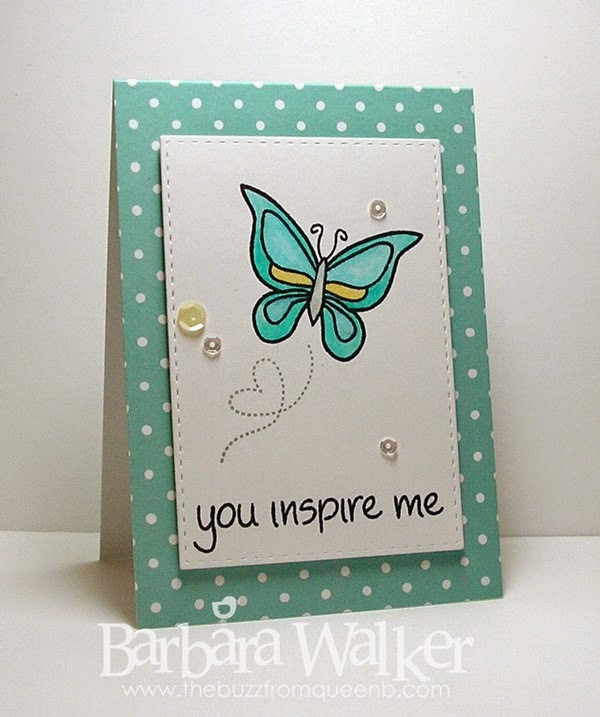 I love this little polka dot note card! I've strayed from the 4 Bar size, might as well give it a try this looks easy enough to whip up a set for gifting!